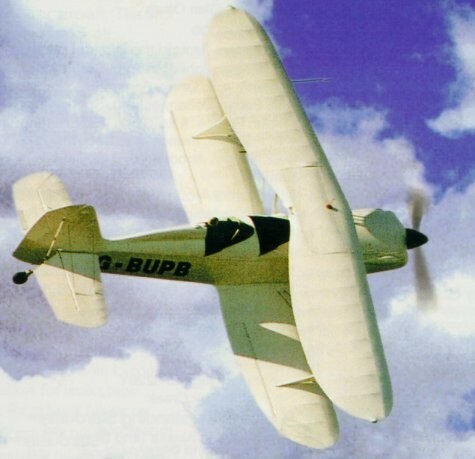 The STARDUSTER TOO was built to fill a need for a reasonably sized, two-place, open sport biplane. It was built to fly just for fun and is not intended to be an aerobatic airplane. It is quite strong, however, and many owners use the aircraft for aerobatic flight, but this is beyond the original concept of the machine. The aircraft is rated +/- 6G. Stability is good and the light wing loading makes slow landing speed and short-field operation outstanding. The main structure of the airplane is built of 4130 steel tubing and sheet stock and has no machined fittings or other complicated bends, which is an advantage for the average homebuilder with limited machine equipment to use. The wings have spruce spars and the ribs are made of 1/4" plywood using a modified M-6 airfoil. Construction of the plane has been kept as simple as possible and it goes pretty well. The prints are quite complete with ribs and most fittings full size, which saves considerable time on construction of these parts. The O-360 Lycoming is the best optimum size engine either in the 180 HP or the 200 HP version. Quite a few Starduster Too aircraft have been constructed with the Lycoming 10-540, with as much as 375 HP. There are Ranger powered, Ford V-8 and V-6 powered, Continental powered, Jacobs, and even some R-985 powered examples. The airframe is a proven unit and allows for many different types and kinds of engines. On the low end of the power curve there are some 125 HP aircraft in service. There are several aircraft with over 2,500 flying hours, and one with more than 5,000 hours. All raw materials as well as certain prefabricated parts (such as fibreglass turtlebacks, nose cowls, wheel pants, cockpit cowlings, welded aluminium fuel tanks, Plexiglas windshields, canopies, and so forth) are available at reasonable prices. Most items are in stock at all times. The Starduster Too, when properly constructed, can be flown by any tailwheel pilot. It is easy and fun to fly, and the plane handles as well in the air as on the ground.